AnyMP4 iPhone 5 Video Converter for Mac 6.1.26 無料ダウンロード - Convert MTS/M2TS/TS/MKV/FLV/WMV, etc. to iPhone 5 video and audio on Mac. AnyMP4 iPhone 5 Video Converter for Mac is the powerful Video to iPhone 5 Converter for Mac software, which can help Mac users convert any video format to MP4, MPEG, and MOV that is supported by iPhone 5. Also, with it you can extract audio files from the videos and then convert them to iPhone 5 compatible audio formats. Besides, you can customize the video effect at your disposal by using the editing functions it provides. AnyMP4 iPhone 5 Video Converter for Mac can convert any high-definition video and common video like MTS, M2TS, HD AVI, MKV, MOD, FLV, WMV, etc. to iPhone 5 compatible formats like MP4, MOV, and MPEG. With this software, you can easily take out the audio file from video and convert them to iPhone 5 compatible audio formats like MP3, M4A, and WAV with lossless audio effect on Mac. 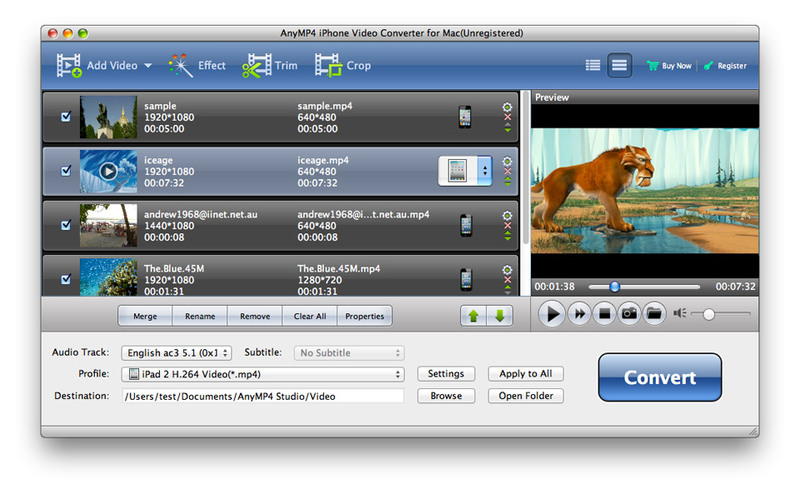 AnyMP4 iPhone 5 Video Converter for Mac can help you trim the length of the edited video to meet your needs. Also you can add image/text watermark to the original video at any place of the video. You can click "Crop" button to crop the video frame at your disposal. And you can also merge several video clips together and output a single one file. The built-in player AnyMP4 iPhone 5 Video Converter for Mac provided can help you preview the effect of the edited files, so it is convenient for you to edit the video. Also, it can help you capture your favorite picture to save on Mac local disk.